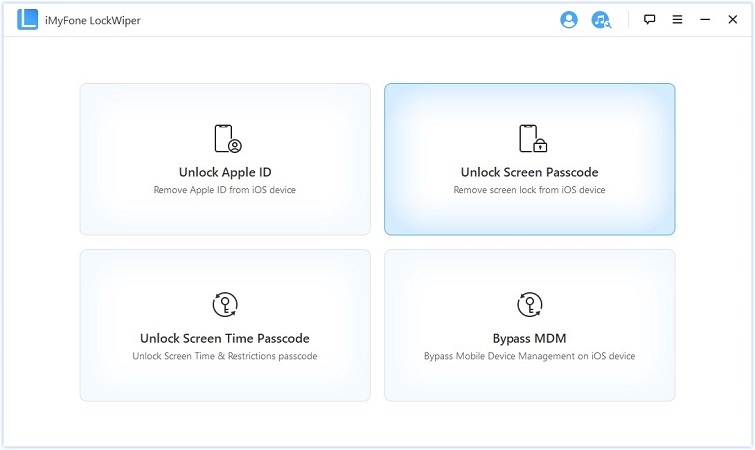 Also known as a screen time passcode, a restrictions passcode is an optional 4-digit code that you can set on your iDevice to restrict what features and applications a person using the device can do who doesn’t know the passcode. Restrictions are often set by parents to prevent their children from accessing certain features and apps. Part 1: What is an iOS Restrictions Passcode Cracker? Part 2: Why We Need an iOS Restrictions Passcode Cracker? Part 3: How to Use iOS Restrictions Passcode Cracker? Part 4: What If the Cracker Cannot Help You? What is an iOS Restrictions Passcode Cracker? Since the Restrictions are not frequently used, it is not uncommon to forget the restrictions passcode. When that happens, you will need a tool to help you crack the passcode because there is no other way to recover it. Such tools are called iOS restriction passcode crackers. Pinfinder is a popular tool in this category. While there are many iOS restrictions passcode crackers available on the market, most of them work only on iDevices running iOS version 7~11. With iOS version 12, restrictions passcode is now moved into Keychain, which means most of the restriction passcode crackers don’t work. So, if you want to crack restrictions passcode of an iDevice running iOS 12 or higher, then you will need to use Pinfinder. This tiny, freeware utility is highly efficient when it comes to cracking restrictions passcode from an iDevice backup. It is compatible with various platforms, including Mac, Linux, and Windows. Not only is Pinfinder free to download and use, it is also safe in terms of privacy as it does not transmit your data anywhere. The code of this utility can be found on Github if you would like to inspect it. Note: Pinfinder does not recover unlock PIN code that is used to gain access to iDevice. It only cracks the restrictions passcode. Why We Need an iOS Restrictions Passcode Cracker? As mentioned above, restrictions prevent access to certain features and apps on an iDevice. If you forget restrictions passcode, you won’t be able to access those certain apps and features. And since there is no official way to recover restrictions passcode on an iDevice, you will need to install an iOS restrictions passcode cracker. How to Use iOS Restrictions Passcode Cracker? Step 1: Back up your iDevice data via iTunes. 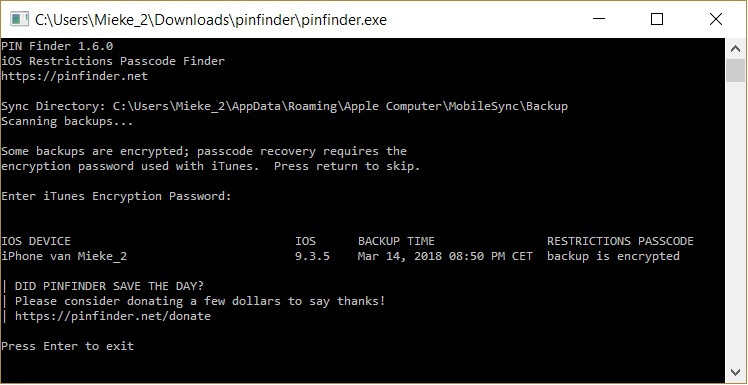 To do this, connect your iDevice to your computer via USB cable, launch iTunes, and then use the Backup button to start the backup process. If your iOS verison is iOS 12, please check the “Encrypt iPhone backup” option. Step 2: Next, download the latest version of Pinfinder from its official website. Step 3: Extract and run the utility. Once the process is complete, you will see the restrictions passcode displayed on the screen. Note: You will only be able to crack/recover the restrictions passcode via Pinfinder if you know the password that you used when encrypting the backup via iTunes. What If the Cracker Cannot Help You? If for some reason the iOS restrictions passcode cracker doesn’t work, you will need to find a way to reset the restrictions passcode. Fortunately, there are several tools available on the market for this purpose. iMyFone LockWiper is a recommended choice. If you don’t remember the password you used to encrypt iDevice backup, you won’t be able to crack restrictions passcode via Pinfinder. In this case, the help of iMyFone LockWiper is invaluable. This tool can reset restrictions passcode efficiently without requiring you to provide the original code. There are many features of this tool. Reset restrictions passcode without providing any code. Remove Apple ID from any iDevice efficiently without providing any password. Bypass/unlock any kind of lockscreen from your iDevice. Supported lockscreen types include 6-digit passcode, Touch ID, 4-digit passcode, and Face ID. Removing Apple ID from an iDevice via LockWiper is 100% safe as you can use a new ID afterwards without any problems. User-friendly software interface. Using iMyFone LockWiper to reset restrictions passcode is easy as 1-2-3. Step 1: Download, install, and launch LockWiper on your PC. Step 2: Use a compatible USB cable to connect your iDevice to your PC. Step 3: Now select Unlock Screen Passcode mode on the home screen of LockWiper. Step 4: On the next screen, click on the Start button. 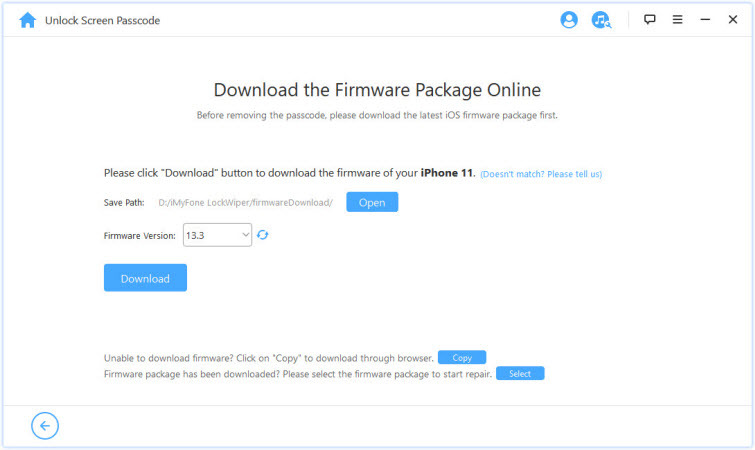 LockWiper will now look for a compatible firmware for your iDevice. You will need to use the Download button once it appears to download the firmware. 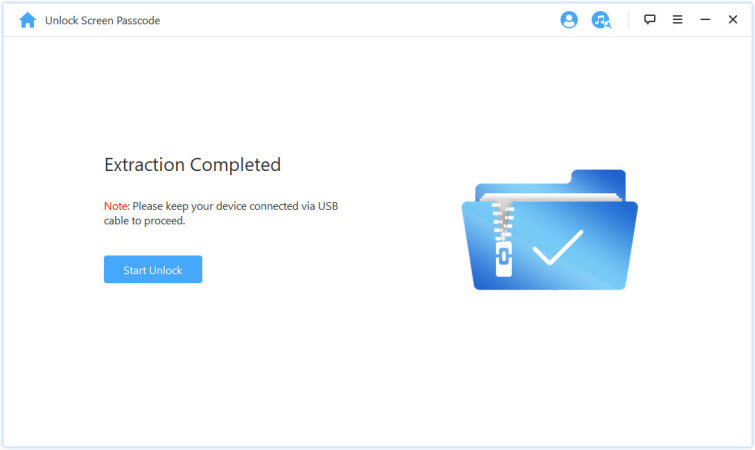 Step 5: Once the firmware is downloaded, use the Start to Extract button and then click on the Start to Unlock button to start the unlocking process. Restrictions passcode will be reset once the process is complete.